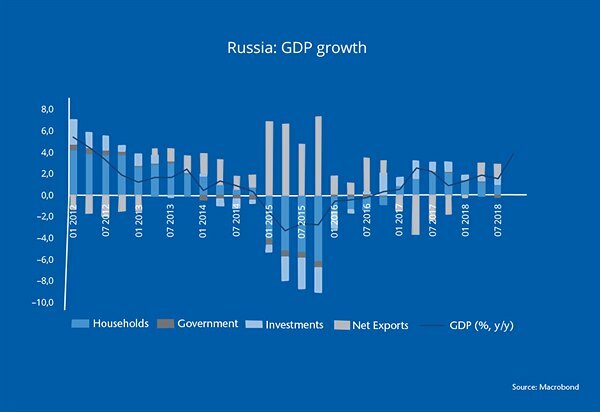 According to the release from the Russian State Statistics Service (Rosstat), the real gross domestic product increased by 2.3 % in the total of 2018 posting a big growth surprise against previous expectations around 1.7 % GDP growth and growth of 1.6 % in 2017. The rise was not predictable and does not match the numbers of the quarterly GDP releases for Q1-Q3. Rosstat did not yet revise quarterly GDP and the annual growth rate implies that Q4 GDP increased by 6.6 % (q/q, non-seasonally adjusted) and 3.8 % (y/y) (Figure 1 - see pdf). In Q3 y/y-growth was only 1.5 % and we had estimated GDP to increase by 1.2 % (y/y) in Q4. There are no expenditure details yet available. In seasonally adjusted terms, we calculate that quarterly GDP growth averaged 0.7 % in Q1-Q3, while in Q4 the growth rate rose to 1.6 %. If it is going to be confirmed, the growth pick-up in Q4 GDP data will lead mechanically to a higher GDP growth forecast for 2019 – all else equal (compared to our previous forecast of 1.5 % GDP growth for this year). Real wage growth slowed to 4.0 % in Q4 after a spike in early 2018 (Q1: +10.1 % y/y). Real disposable incomes stagnated (+0.6 %) during 2018 following a decline in 2017 (-0.8 %). Weakening income growth coincided with slowing consumer demand indicators. During the fourth quarter, growth in retail sales moderated gradually (+2.7 % y/y) compared to Q3 (+2.9 %). Car sales expanded by 5.7 % (y/y) compared to 8.3 % during Q3 2018. Hence, high frequency consumer indicators do not suggest a rise in domestic demand by year-end (Figure 2). Industrial production rose by 2.0 % in November compared to 2.8 % during Q3 and neither points to accelerating economic activities in Q4 2018. The consumer price inflation rate picked up during the second half of 2018 after it had reached a low in June (2.3 %). In January, inflation rose to 5.0 % (from 4.3 % in December) mostly driven by increasing food & beverage prices (contributing 2.1 %-age points to inflation) and likely driven by the VAT tax increase as well as the drop in H2 2017 (Figure 3 - see pdf). On last Friday, the Central Bank of Russia (CBR) left the key interest rate unchanged at 7.75 % after increases in September and December (each 25 basis points). The CBR will determine if the increases were sufficient to bring annual inflation back to the target in 2020. The central bank forecasts that inflation will peak in the first half of the year and range between 5.0 % and 5.5 % by the end of 2019 and return to 4 % (the inflation target) in H2 2020. Commenting on economic activity, the CBR says that recent months have seen weaker economic activity and maintains its 2019 GDP growth forecast in the range of 1.2-1.7 %. Besides inflation and economic activities, the CBR will also take into account risks associated with external conditions and financial markets’ response to them. A growth acceleration during end-2018 would yet have to be confirmed by additional evidence. High-frequency data points to recent weakness in economic activities towards the end of the year. Inflation started to rise and will likely reach a peak during the first half of the year, before slowing towards end-2019. Short-term nominal appreciation of the ruble appears less likely to us after the oil price correction in Q4, according to our model. In the absence of external shocks, weak growth and slowing inflation could pave way for the central bank to reduce the main interest rate by year-end 2019. In the Czech Republic monetary policy normalization has already reached an advanced stage. In 2018 the Czech National Bank’s (CNB) Board decided to increase its key policy rate five times, 25 basis points (bp) each, after a rate hiking cycle was initiated in August 2017. At the CNB’s monetary policy meeting last Thursday the Bank Board decided to keep interest rates unchanged. The two-week repo rate, the CNB’s key interest rate, is currently at 1.75 %. A near-term continuation of the rate hiking cycle is less than certain, even though, the neutral level of the interest rate, which lies roughly between 2.5 and 3.0 %, has not yet been reached. The CNB justifies the more cautious approach by increasing anti-inflationary effects of import prices. Imported inflation is forecast to be subdued based on slowing growth in foreign prices, mainly due to lower inflation in the Euro Area, as well as renewed appreciation of the Koruna, which makes imports cheaper. Yet, interest rate increases are not off the table for 2019. If the recent drop in the Euro Area’s economic momentum proves to be transitory and/or Koruna appreciates less than anticipated, the CNB would most likely react by raising interest rates. During the press conference’s Q&A session of last Thursday’s monetary policy meeting, Jiří Rusnok, the CNB Governor, confirmed that he could imagine no hike, one hike or two hikes during the year 2019. The strongest case for a gradual monetary policy normalization can be made based on the CNB’s exchange rate assumptions. In its first Inflation Report of the year, the CNB expects the Koruna to reach 24.5 CZK/EUR in Q4 2019 and 24.1 CZK/EUR in Q4 2020. Last Friday CZK/EUR was at 25.8 which implies an appreciation of 5.2 % by Q4 2019. Based on our own estimate of the Koruna’s equilibrium exchange rate, the CNB’s exchange rate forecast looks rather optimistic. A behavioral equilibrium exchange rate model (BEER), shows the Koruna to appreciate more gradually compared to the CNB’s projection (Figure 4 - see pdf). Koruna appreciation is mainly driven by the Czech economy’s productivity catch-up to the Euro Area as well as a positive interest rate differential. During last week’s meeting, two members of the CNB Bank Board voted for increasing interest rates by 25 basis points, while five members voted in favor of maintaining rates constant. The two members voting in favor of a rate hike referred to inflationary pressures stemming from buoyant wage growth and the depletion of the labor market. Gross nominal wages have increased by 8.6 % (y/y) on average during the first three quarters of 2018. Thus, it is important to note that mainly the worsening outlook of the external environment and its anti-inflationary effects speak for a more patient normalization of interest rates. The domestic economy continues to grow at a solid pace, even though, growth rates have come down lately. The CNB describes the latter as “a healthy cooling of the economy”. GDP growth is projected at 2.9 % in 2019 and 3.0 % in 2020, which is slightly lower than in the CNB’s Q4 2018 Inflation Report (3.3 % for 2019-20). Despite the downward adjustment, the updated projections are consistent with the long-run equilibrium growth rate of the Czech economy, which the CNB sees at 3 %. With GDP growth at its potential and inflation projected at the CNB’s target (2 % in 2020), the Czech National Bank has the flexibility to wait for more clarity regarding the external economic environment before interest rate normalization continues. Yet, as these projections are also based on a strong appreciation of the Koruna, the pressure to bring the key interest rate closer to its neutral level may rise depending on the development of the exchange rate.